Friends. My fascist brothers and sisters. Words cannot express how wonderful it was to be back amongst you, and on the auspicious occasion of our second birthday. I can’t believe we’ve been going for 2 years now, but I’m so pleased we have. I’ve seen films I’d never heard of, films I have always wanted to see but never got round to, and even films that I wasn’t really bothered about seeing but enjoyed nonetheless – such is the power and joy of dictatorship! So, how did we usher in our third year of film fascism? We were taken to the far reaches of the galaxy by the proprietor of the newly opened Fritzy, Comrade J. Love, with a showing of the Stanley Kubrick classic, 2001: A Space Odyssey. Last night marked a welcome return to food themed to match the film, with a delicious meaty stew accompanied by pink and green mashed potatoes and dehydrated space ice cream, to mimic the food eaten by the astronauts in the film (Comrade Smith, D: “There are no calories in space food because it’s weightless”). To increase the feeling of an immersive film experience we adopted the habit of prefixing words with ‘space’ (the organisers of Secret Cinema are quaking in their boots). E.g. space plates, space cups and, erm, space cakes. These were allegedly child-friendly chocolate- iced cupcakes sprinkled with chocolate-coated popping candy, but some of the giggling that went on during the screening did lead us to suspect Jon’s honesty. Having said that, the striking similarities between the row of apes on the screen and four of the film fascists on the sofa were particularly humorous! Technologically, we had another first, watching the film on the big screen courtesy of a projector, a wall and a pair of step ladders. I’m not sure if this qualifies for the ‘Who’s got the biggest telly?’ competition (current contenders – Sam, Jess and Lucy) as strictly speaking it’s not a telly, but regardless of this it really enhanced the viewing experience. We also went a bit Pixar, showing 2 short films before the main feature. The first was the video to support the NDCS Stolen Futures campaign, as promoted by our very own Jess. Please make sure you sign the petition, and share it with your friends and get them to sign it too! The second short was the traditional MNFC montage of the year (does doing something twice make it a tradition?! ), which I had hoped to bring you in the review but unfortunately YouTube is not cooperating. Comrade Love will make it available shortly. Use of music – Much of the film was accompanied by classical music, heavy breathing or people making annoying ‘bee’ noises which were used to create the appropriate atmosphere. Most notable was the recurrence of Johann Strauss’ Blue Danube Waltz, and the use of Richard Strauss’ Thus Spake Zarathustra. Its ability to predict the future – we spotted prototype iPads and use of Skype, as well as the prediction that the BBC would expand beyond 1 and 2. Its enduring influence on film and television – fascists spotted references in Wall-E, Moon, Star Wars, Willy Wonka & the Chocolate Factory, Red Dwarf and Clueless to name but a few. The film was inspired by a number of short stories by literary science fiction colossus Arthur C. Clarke and was also turned into a novel of the same name by Clarke, which was released after the film. Apparently the novel offers more insight into the film, in particular the actions of HAL, and an explanation of the monolith. As the film was quite long, we had to cut short the post-film chin stroking but this was not too much of a problem as the endless silences in the film itself, and the handy intermission meant that we were able to combine viewing and commenting. There were in fact 88 minutes without dialogue in the film, including the first 25 minutes and the final 23 minutes. 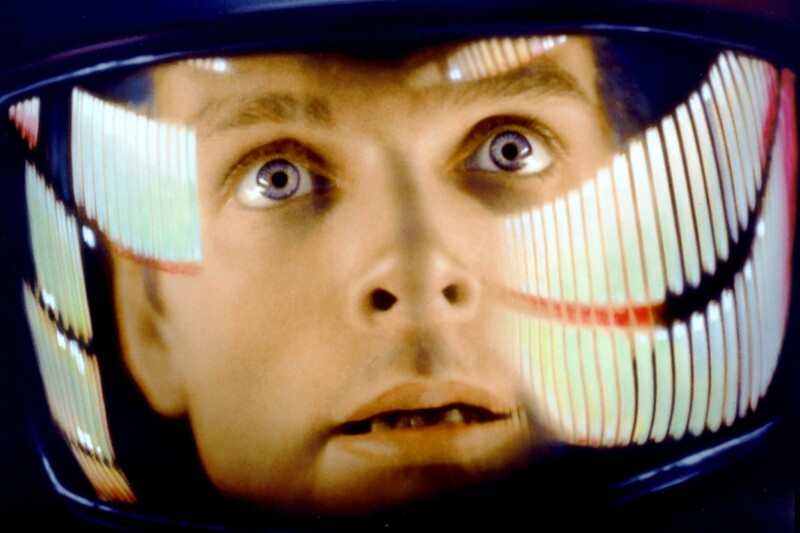 In spite of weak box office showing on its first release, 2001: A Space Odyssey has gone on to become a cult classic and features on lists of best films ever made all over the world, including the BFI Sight & Sound poll of 2012. Was there any criticism of IBM implicit in the film? Just why did HAL sing ‘Daisy Bell‘ while the plug was being pulled? An original 1968 review of the film from The Observer. The very cute girl who played Dr Floyd’s daughter was in fact Stanley Kubrick’s daughter. (One for Susan) The voice of HAL was at one point going to be provided by an actor with a cockney accent! See you all again at the house of Comrade Smith, L. on the 4th March for the first session of our 3rd year of existence! I hope your dreams are not too trippy. THIS IS NOT A DEMOCRACY, DAVE. Every bit as timeless and groundbreaking as Stanley Kubrick’s commentary on human evolution and emotion… but with boobies. Fabuloso review Becca and fabuloso evening Jon! And thanks for plugging the petition we’ve had 2,500 more signatures since we launched the film on Friday – which ain’t bad at all! I kept myself well stocked with drinks too, though. It was an honour to be a guest / subject. And I learnt how to do Number 2’s in space!